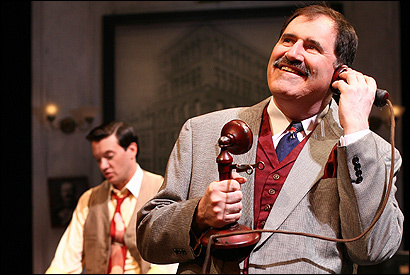 Jason Butler Harner (left) as a young reporter and Richard Kind as his demanding editor in "The Front Page." It's always a challenge, resurrecting a classic play that has become far better known as a film. In taking up Ben Hecht and Charles MacArthur's 1928 comedy "The Front Page," the Williamstown Theatre Festival has set itself the perhaps insuperable task of eclipsing "My Girl Friday," the delightful 1940 adaptation starring Rosalind Russell as headline-hungry Chicago reporter "Hildy" Johnson and Cary Grant as her relentless taskmaster of a boss. WTF's production is fairly faithful to the original. Genders stay put -- the film had changed Hildy's role to a woman's -- and cuts are minimal: The play still runs nearly three hours, and most of its pre-PC racist epithets and misogynistic elements remain intact. This is not so sacrosanct a script, however, that a bit more snipping and sidestepping would have seemed amiss. In fact, so familiar by now are the poker-playing, repartee-slinging conventions of the typical bullpen press room -- thanks, no doubt, to the period movies that "The Front Page" inspired -- that we don't even really need the gradual, atmospheric set-up established in Act One. Hildy Johnson is meant to burst onto this torpid scene like a vision of youthful manly vigor. Sure, he can toss off cynical comments like the rest of the crew, but he has a life force that the old hacks have long since forfeited. As Hildy, Jason Butler Harner exhibits plenty of bluster, but it seems forced, not the product of an innate élan. If you have to work too hard at projecting panache, it defeats the purpose. Hildy has grand plans: to quit the paper and hop the night train with his fiancee -- and her Gorgon of a mother -- to New York City, where a well-paying position in the ad biz awaits. It's his managing editor's job to thwart this upwardly mobile idyll: Walter Burns (Richard Kind) didn't bring Hildy up from copy boy to have his star reporter decamp in the midst of a major story. Burns is only a bullying voice on the phone until well into Act Two, but director Ron Daniels has chosen to forgo a voiceover, instead having Kind sporadically materialize behind the scrim of a large photo on the wall. The device not only lends Burns an odd "Wizard of Oz" aura, it suggests a desperate measure to make maximum use of Kind's star power. That, he certainly possesses: It's only when Burns finally does turn up in the flesh -- soon after Hildy finds himself face-to-face with the man of the hour, escaped murderer Earl Williams (Bill Cwikowski, appropriately puny and cowed) -- that the play truly comes to life. Kind has a gift for physically savoring the words and images he's tossing about. He takes command of the stage just as forcefully as Burns tries to commandeer his deserting lieutenant. Other casting has its ups and downs. Wayne Knight is passable as corrupt Sheriff Hartman, though his wheezy voice doesn't lend itself especially well to stage work. Tom Bloom is the portrait of patrician skullduggery as the Mayor, Har t man's partner in corruption. Kathy McCafferty is way too drama-schoolish in her portrayal of Mollie Malloy, the whore with a heart of gold who's sweet on Williams: She milks the role. However, Amanda Leigh Cobb is just peachy as her good-girl counterpart, Hildy's betrothed, Peggy Grant , and Kay Walbye, playing Peggy's much-abused mother, makes the most of her few moments onstage. You don't find many plays these days that call for a cast of 28, and all the yeomen disport themselves commendably. Greg Hildreth stands out as "Woodenshoes" Eichorn, a flat foot who likes to spout psychology (or his approximation thereof), and Robert Stanton shines as press-room fussbudget Roy V. Bensinger (the Edward Everett Horton role in the original 1931 movie). Bensinger is chicken feed for a powerhouse like Walter Burns, and his poetic ego makes a fine sacrificial offering.